it’s official… i’m in a funk. it might just be a case of the winter blahs or the fact that me and the husband are in desperate need of a little vacation, but i’m blue. i’m not much for wallowing in a bad mood for too long and delicious food usually brings me back to my happy, albeit synical self, so i better get cooking! i have a roast chicken all ready to go into the oven for dinner tonight and, after going through my recent food photos, i realized that i have yet to share my orange chocolate angel food cake with you all. 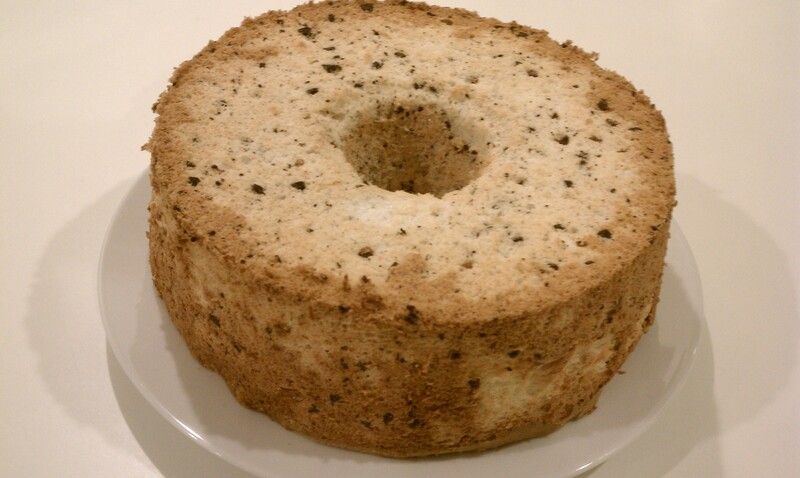 angel food cake usually bores me to tears and doesn’t do much to satisfy my extra-large sweet tooth, but while i was on my month long health kick, i developed a recipe that i think you’ll like. chocolate and orange together is one of my favorite taste combos and it really does something to heighten this guilt-free dessert without adding a bunch of guilty ingredients. if you don’t have an angel food cake pan you can use a regular tube pan and hang it upside down on a wine bottle to cool the cake. 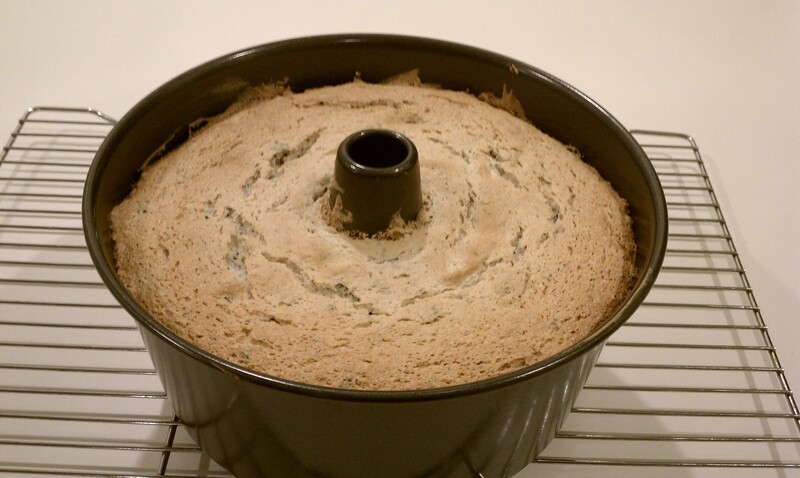 angel food cakes need to cool, suspended upside down so they won’t fall like a souffle. let’s get happy and bake a cake! preheat oven to 325 degrees. 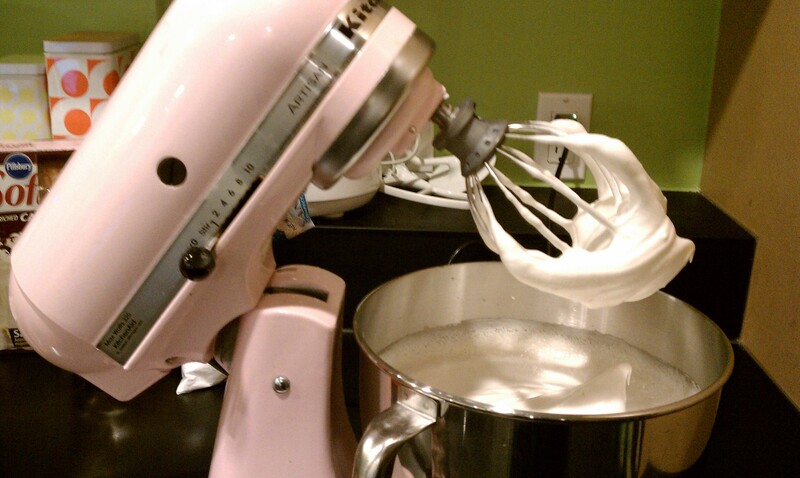 in the bowl of an electric mixer, fitted with the whisk attachment, beat the egg whites and the cream of tartar on high until soft peaks form. 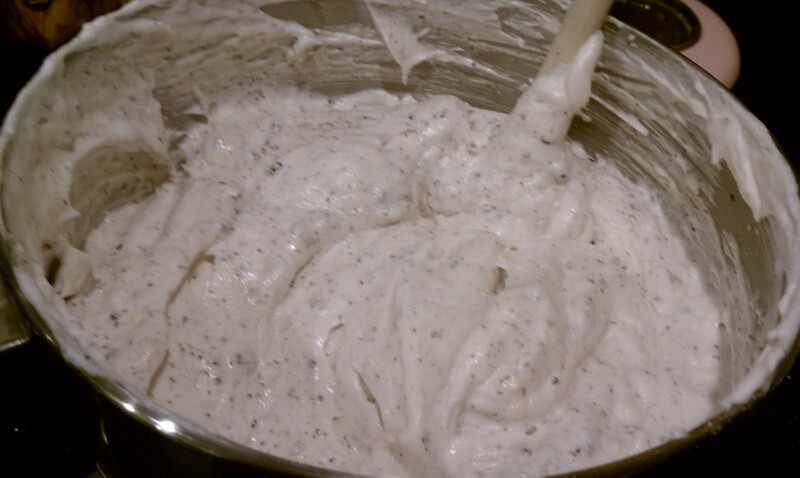 with the mixer still running, slowly add the sugar, and then the orange juice, orange zest, vanilla and salt and continue beating until stiff peaks form. 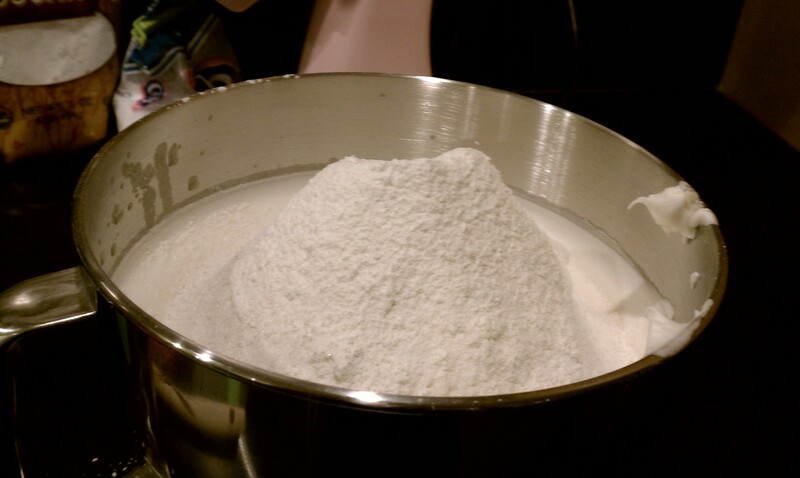 off the mixer, sift the flour right over the stiff egg white mixture and gently fold in with a spatula. add the chopped chocolate and gently fold in. 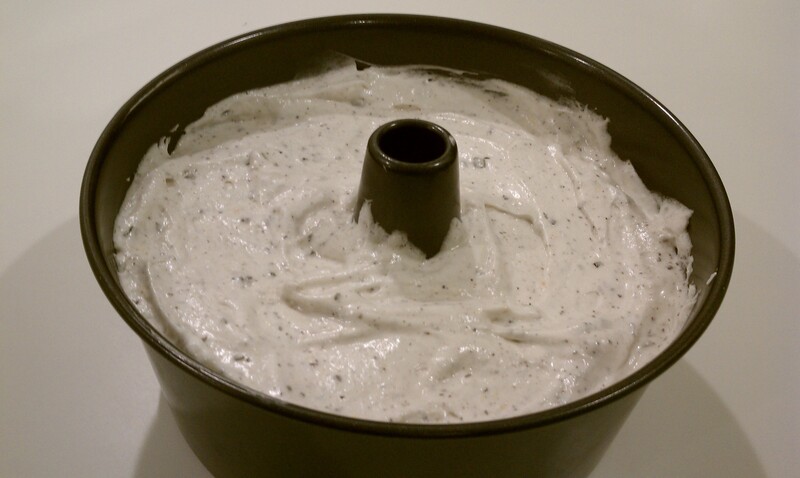 pour into an ungreased tube pan and bake for around 40 minutes. 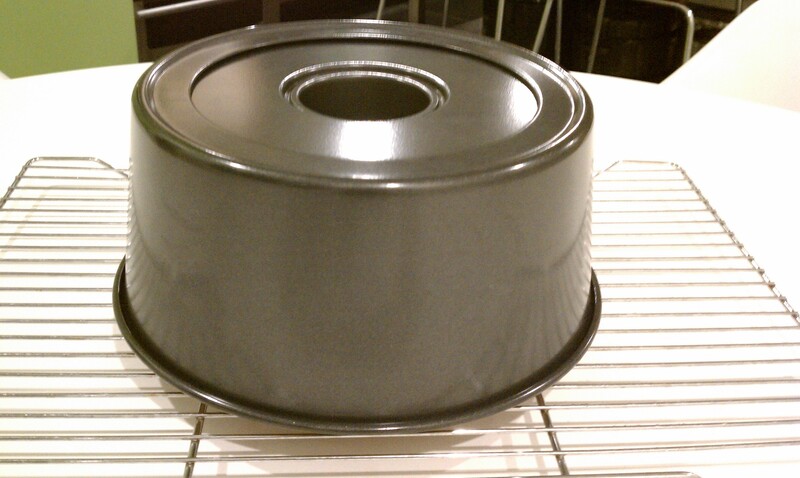 turn the pan upside down on a rack and let the cake cool completely. run a knife along the sides of the pan and remove the cake. put on a plate and pour the glaze over the cooled cake. let the glaze dry a bit and then serve. i’m starting to feel a little sunnier already. 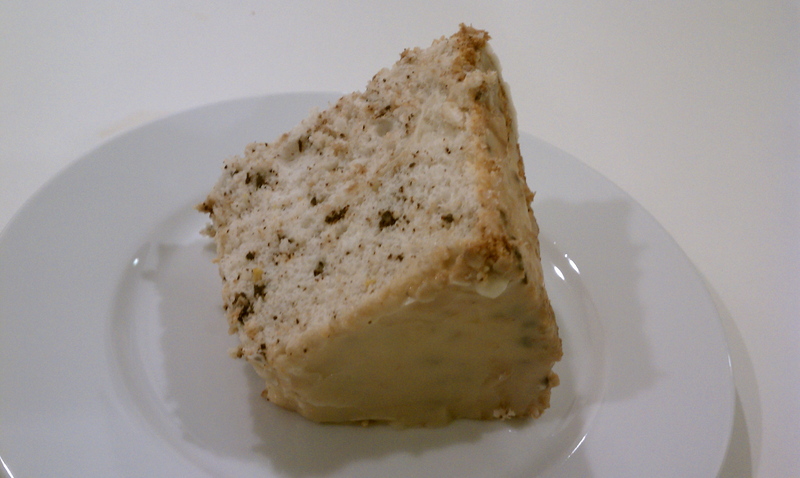 this light and airy cake is the perfect ending to any winter meal. the bits of chocolate and orange take boring old angel food in a much more exciting direction in my opinion. happy baking everyone! i went to culinary school back in the mid 90's where i soon discovered that most of my favorite things to eat begin with celery, carrots and onions; or at the very least, one of the three. i cooked professionally for a very short time, but never stopped being a "home cook". i used the skills i acquired in school to teach myself to bake and kept up on food trends by becoming addicted to cooking shows and food magazines. i will eventually open my own soup shop, but until that happens, this blog will be my culinary outlet. i hope it inspires you to... stand lovingly over a simmering pot, wait anxiously for rising bread dough, frost cupcakes with care, marinate, brine, and most importantly... make it yourself! 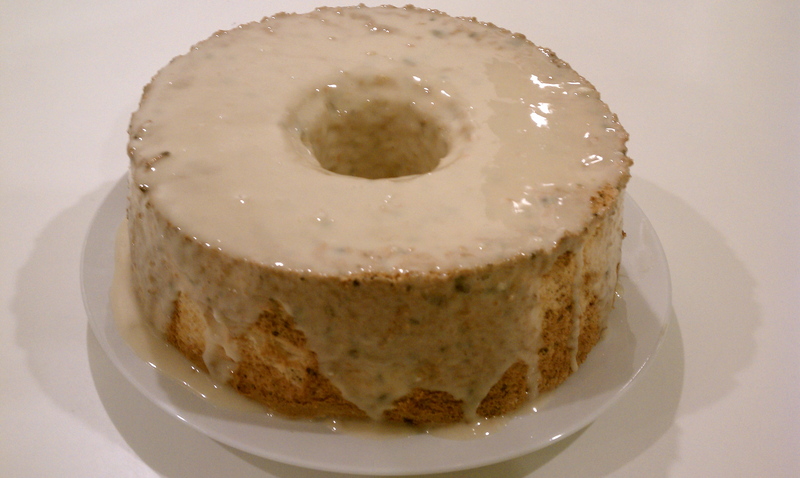 This entry was posted in Desserts, Recipes and tagged angel food cake, cake, chocolate, dessert, food, orange, recipe, winter. Bookmark the permalink.